Global climate models fail to represent the annual cycle of tropical‐extratropical cloud bands and produce too much summer rainfall over subtropical southern Africa. This study demonstrates that running a regional convective‐permitting climate simulation alleviates these biases, counteracting biases that are present in the parent model. The improvement emerges from stronger vertical mass flux in the tropics, which forces a stronger local Hadley overturning into the summer hemisphere. This enhanced overturning increases upper‐level subsidence in the subtropics and amplifies the forcing of the local subtropical jet. 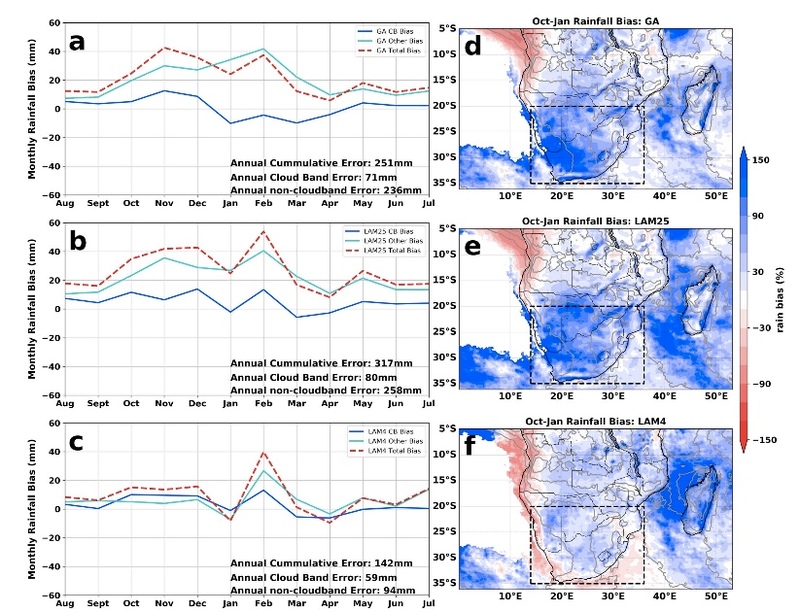 Together, these improvements halve the wet subtropical rainfall bias and are associated with a 50% increase to an 80% match between the simulated and observed annual cycle of crucial tropical‐extratropical cloud band rainfall systems. The results advocate for the increased use of convective‐permitting climate models with domains that include regional tropical convection hot spots, in order to fully benefit from the explicit representation of deep convection.